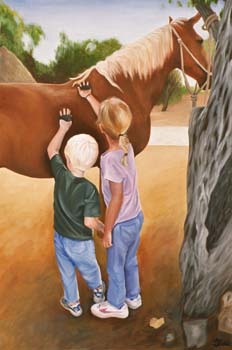 Before riding, the horse must be brushed and cleaned. My son stands close within the protective reach of his big sister. He is not quite sure about this big animal. Palomina is a mare at the Kunuku Warahama, Bonaire. 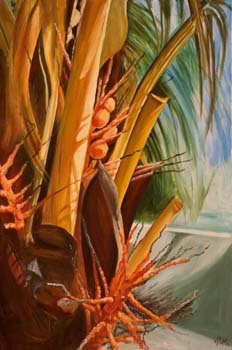 Here is a close-up view of the birthplace of the coconut deep in the heart of the palm tree. They begin life as small brilliant orange clustered buds which grow to football size. They then brown and the heavy branch will eventually break from the weight.